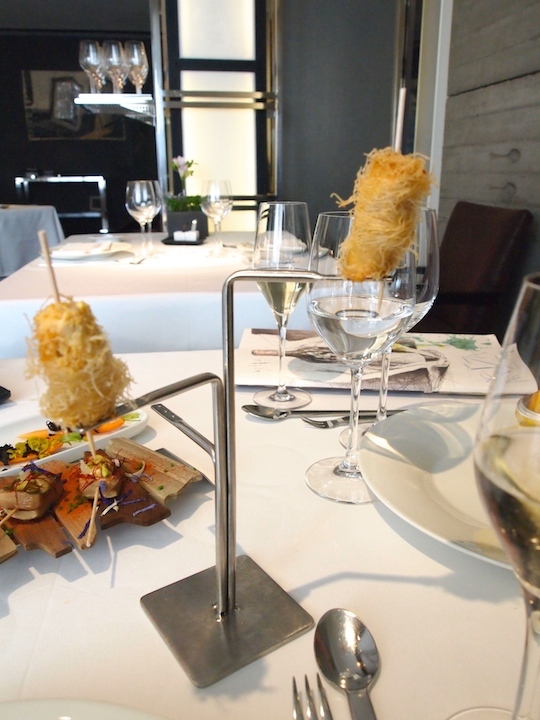 This year marks the 25th anniversary of Arzak in San Sebastian, Spain, as a three Michelin star restaurant. When Chef/patron Juan Mari Arzak was awarded the third star in 1989, he was the second Spanish chef to receive this honour. Arzak was originally established as a tavern by Juan Mari's grandparents in 1897. Juan Mari has been in charge of the kitchen since 1967 and he was one of the founding fathers of the Nueva Cosina Vasca (New Basque Cuisine) movement that started in Spain in the late 70s, a cuisine that found international acclaim in the 1990s. Working alongside her father and joined head chef since 1996 is Elena Arzak, the fourth generation in the Arzak family business. Father and daughter have become an illustrious duo and Elena is certainly a renowned chef in her own right. Arzak has held a top 10 position in the World's 50 Best restaurant lists since 2006, having occupied the number 8 spot since 2011. In 2012 Elena Arzak picked up the San Pellegrino's Best Female Chef Award. 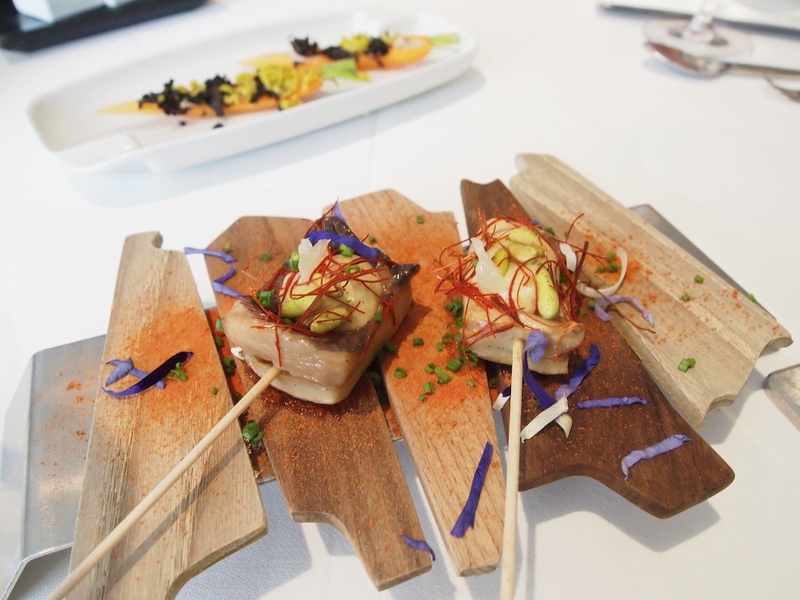 Apart from the San Sebastian flagship there's also a London Arzak restaurant called 'Ametsa with Arzak Instruction', located at the Halkin Hotel. Arzak is open for lunch and dinner Tuesday till Saturday. The restaurants offers an a la carte menu and a 7-course tasting menu for €189. For some reason, the menu stipulated explicitly that the tasting menu cannot be mixed with dishes from the a la carte menu. 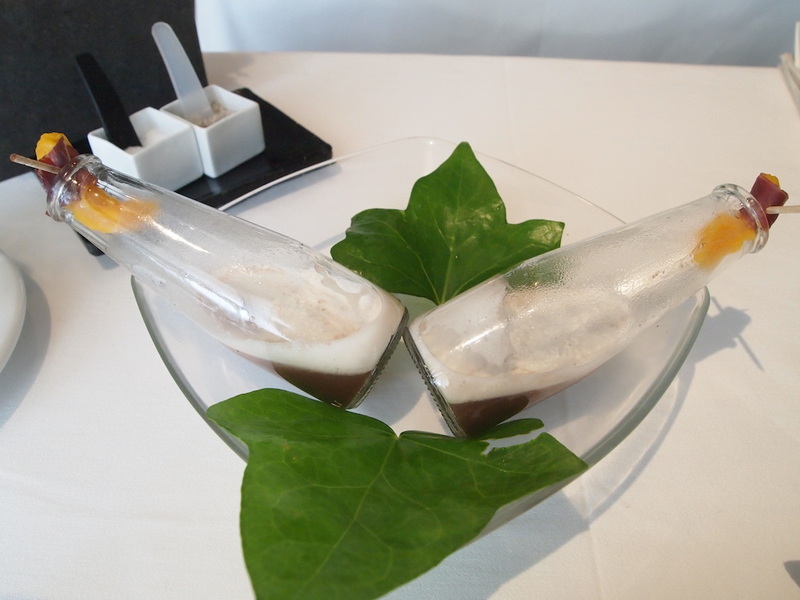 I had lunch with my husband at Arzak on Tuesday 1 April 2014 and we both ordered the tasting menu. To start there were five appetisers. Scorpio fish wrapped in crisp Kataifi pastry - Mango, lightly marinated with tonic and a mango parcel with a deliciously intense, smoky chorizo filling - Juicy and beefy mushrooms filled with citrus cream and pine nuts - a bottle with an apricot and dried beef "cork", filled with a concentrated bean and apple soup and a bean foam - crunchy sweet carrots topped with sliced, pickled Guindilla peppers and an anchovy cream. Five delicious appetisers with attractive flavours. First course of the tasting menu was a combination of foie gras and apple. Three foie gras bonbons, coated with a mixture of chopped almonds and pistachios, and covered with thin slices of beetroot-injected apple, accompanied by a potato cracker, dots of leek sauce and thin, saffron-like threads of chilli. The flavour marriage of foie gras and apple worked wonderfully in this dish. The foie gras had a lovely buttery texture, the nut mixture provided a nice contrast, the apple delivering a fresh touch. Loved the subtle heat from the chilli threads, but the leek sauce didn't really add much to the dish and the beetroot was lost on me. Shortly after the second course arrived: Volcanic oysters with smoked vegetables. 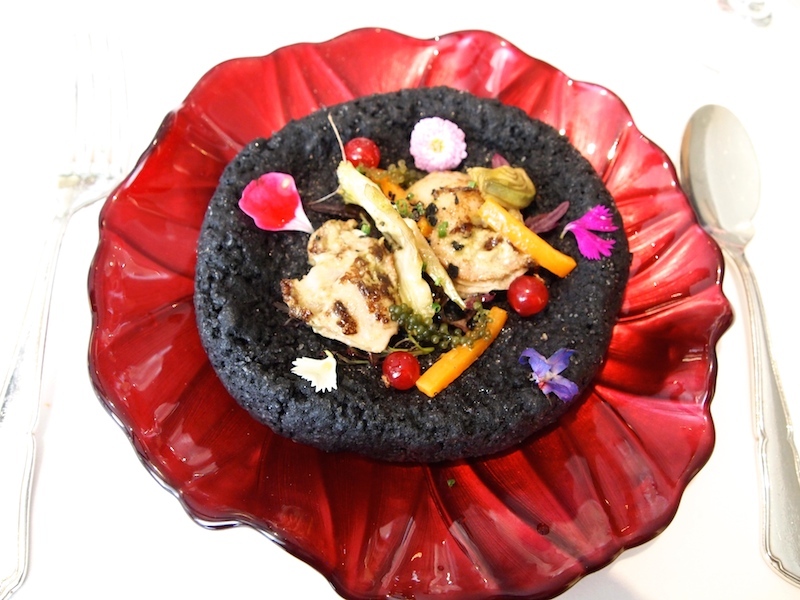 Two gigantic oysters (cooked a la plancha), artichokes, edible flowers, red currants, sea grapes and carrots, served in a bowl made from black volcanic rock salt. Lovely rich, mildly smoky oysters, that had a nice meaty texture and their sweetness was intensified by the artichokes. This was followed by a dish described on the menu as Ovo-lacto. 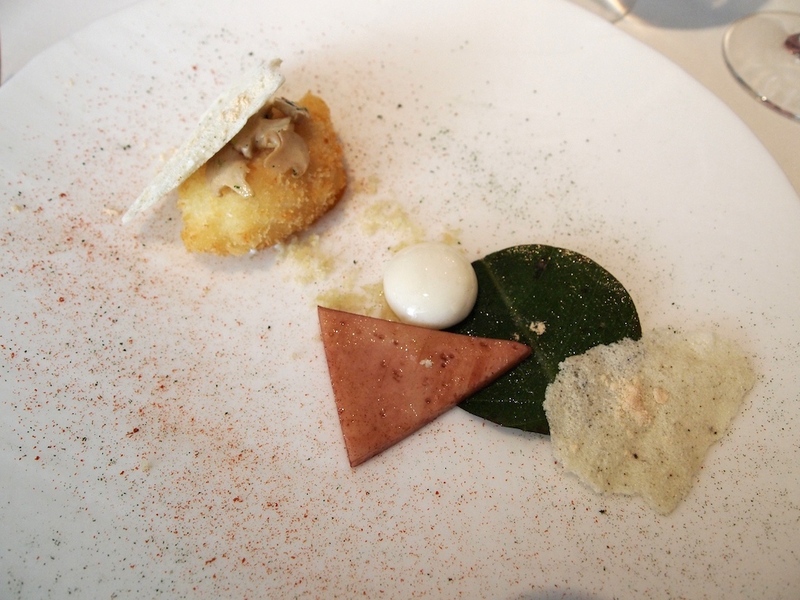 On the plate was a crispy egg with a perfectly runny yolk, a liquid blue cheese sphere, some 'sacha incha' (also known as Inca peanut) crumble, a wedge of local cheese soaked in port, a wonderfully brittle milk crisp and tomato, parsley and green tea powder. Not the most attractive dish to look at, but flavourwise it delivered, the powders playing a surprisingly crucial part. 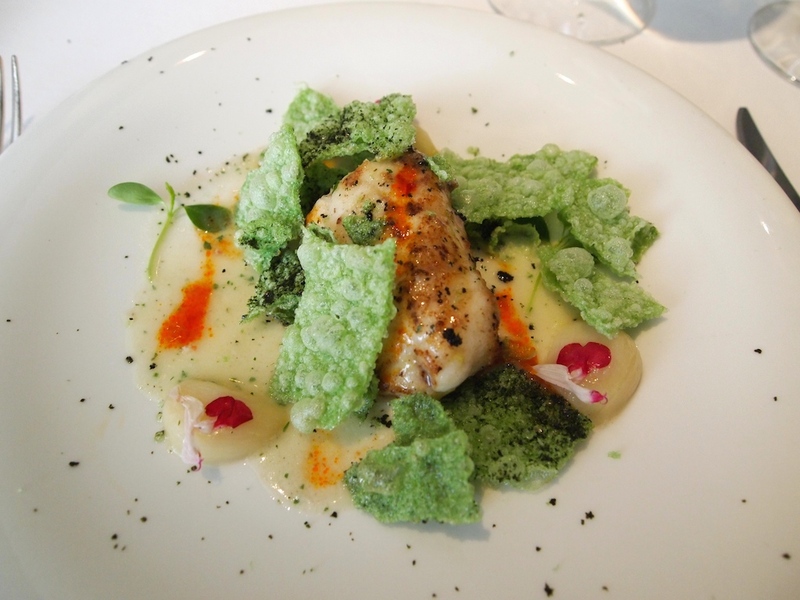 Fourth course was (as described on the menu): "Monkfish with sea buckthorn and crispy lobster roe". Succulent monkfish, superbly cooked a la plancha, served with a creamy 'salsa verde', some soft and sweet roasted garlic and covered with a puffed rice and seaweed 'cloche'. The cloche wasn't just there for show. When combined with the monkfish and salsa verde, it delivered a marvellous fusion of Spanish and Asian flavours and a great textural contrast. 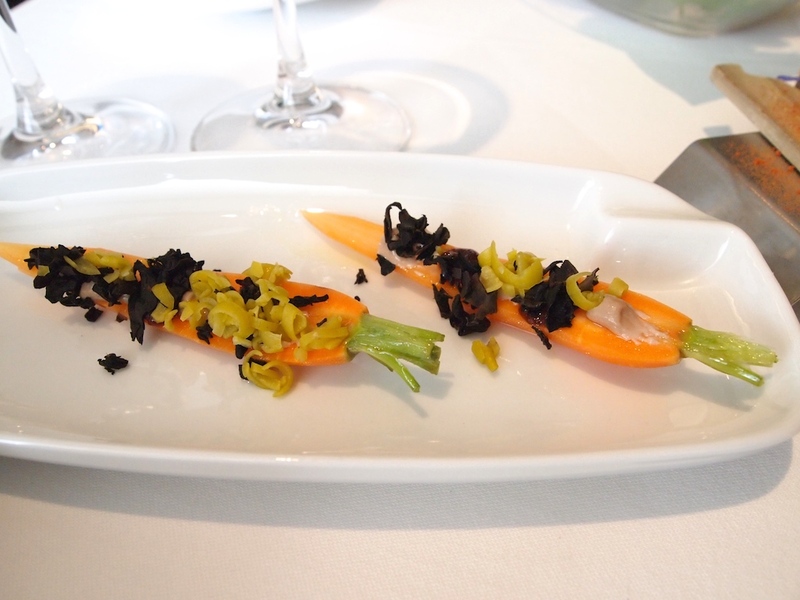 Unfortunately I wasn't able to identify the sea buckthorn and crispy lobster roe on the plate. There was a sauce with a bright orange colour similar to sea buckthorn, but to me that tasted like a (rather lovely) red pepper sauce. 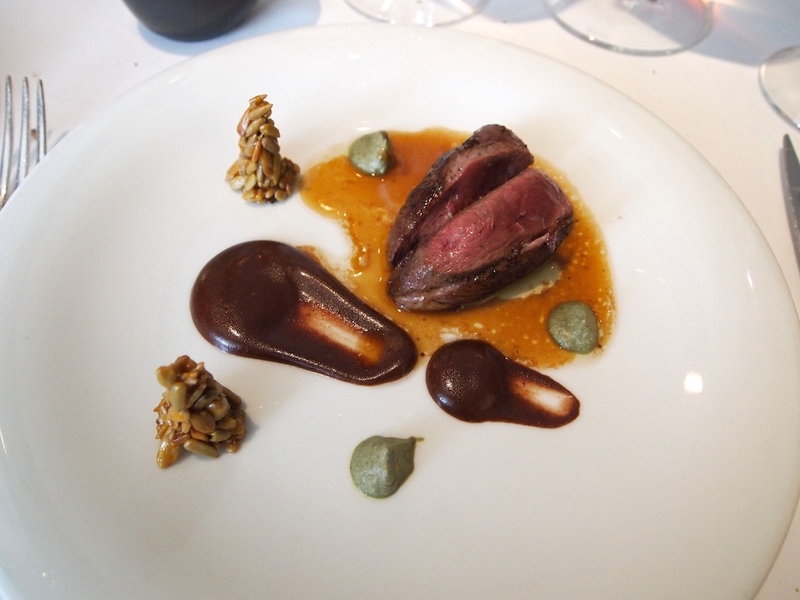 Last course before dessert was tender and flavoursome pigeon, served with a pigeon jus, a concentrated grape sauce/puree, pumpkin seed puree, and two sticky sunflower seed and caramel 'towers'. A confit pigeon leg with apple and almonds was served on the side. A magnificent and quite intoxicating combination of flavours. Lovely rich, buttery flavours from the pumpkin seed puree and the sunflower seeds delivered great crunch. 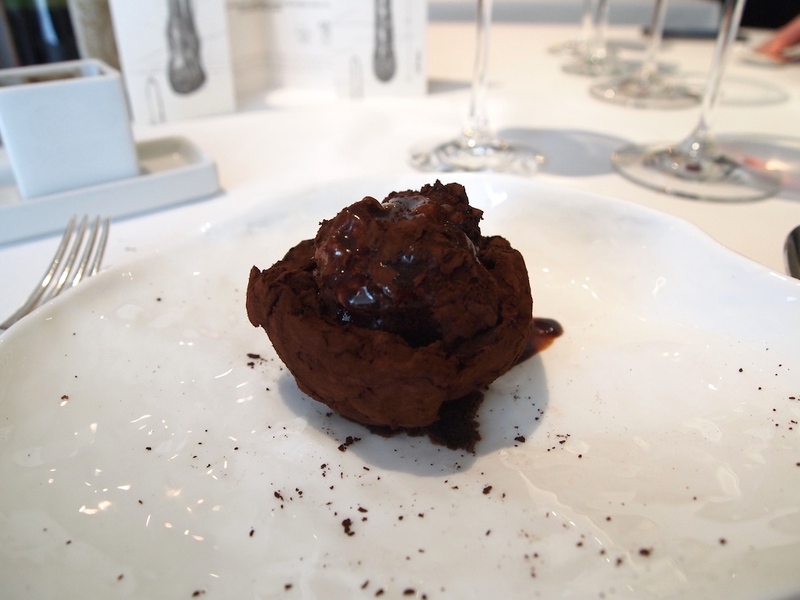 Last but not least the grape sauce; it had a great depth of flavour and a lovely hint of cacao. Dessert was excellent. 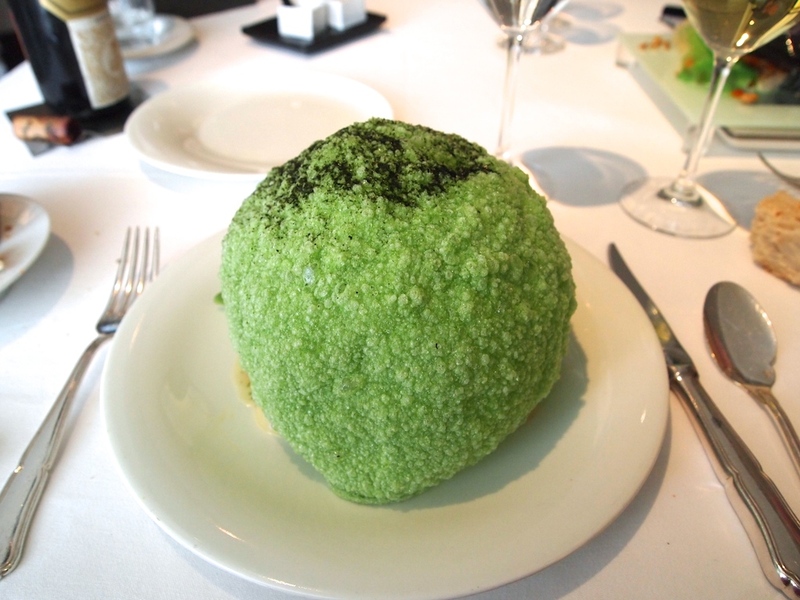 A large chocolate truffle with a filling of creamy chocolate, candy floss and crunchy bread crumbs. With the truffle came a lovely chocolate and orange liqueur sauce and a even better chocolate and carob sauce, the latter having gorgeous earthy-sweet, almost mushroom-like flavours. Last and seventh course was a "Açai Granita". An elegant and refreshing granita (although I'm not sure what it was actually made of), served with small pieces of frozen Açai berry juice and a deliciously creamy and mildy bitter almond ice cream. Chocolates to go with our coffees. Arzak is a legendary restaurant. 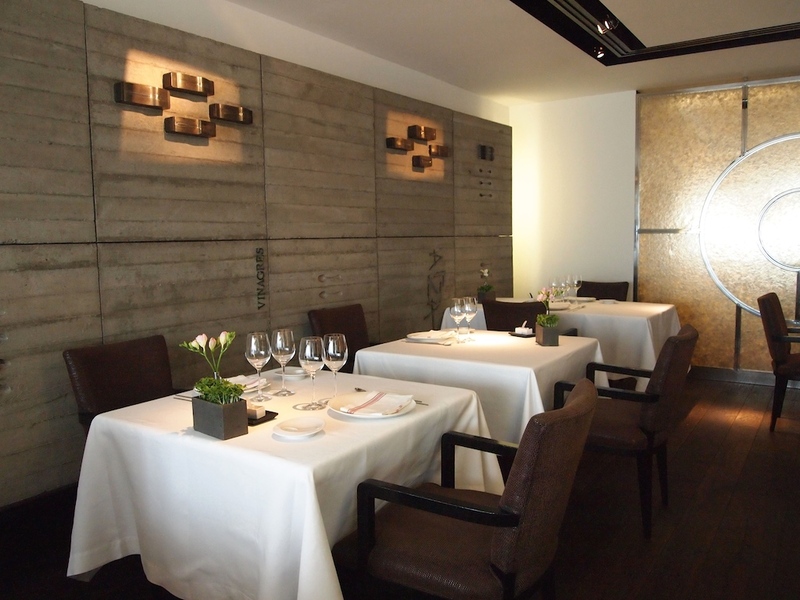 Next to Mugaritz, Arzak is the only top ten restaurant from the 2006 World's 50 best list to still be in the top ten. In Spain, its credentials are second to none. It enjoys an enviable international reputation that is perhaps only matched by El Celler de Can Roca in Girona and, indeed, Mugaritz. Accordingly, my expectations were high when I came here. But the gastronomically dazzling experience that I was hoping for, did not materialise. 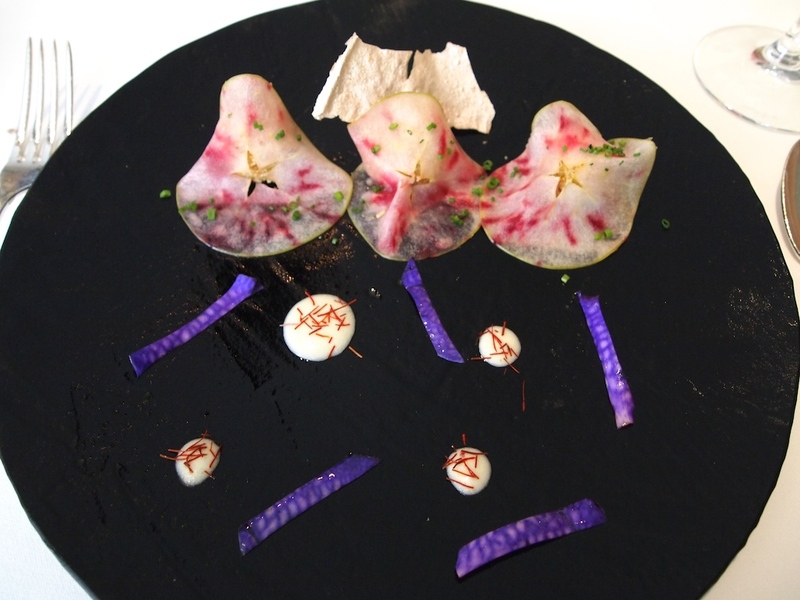 The kitchen at Arzak produces interesting and creative dishes that display a lot of technique but not everything works. Both the monkfish and the pigeon were fantastic, but some of the other dishes missed the mark. Surprisingly, the English version of the menu was a slightly fanciful cryptogram. Service was friendly, but also came across as rather indifferent. The pace was high; the entire meal was pushed through in about 2 hours. 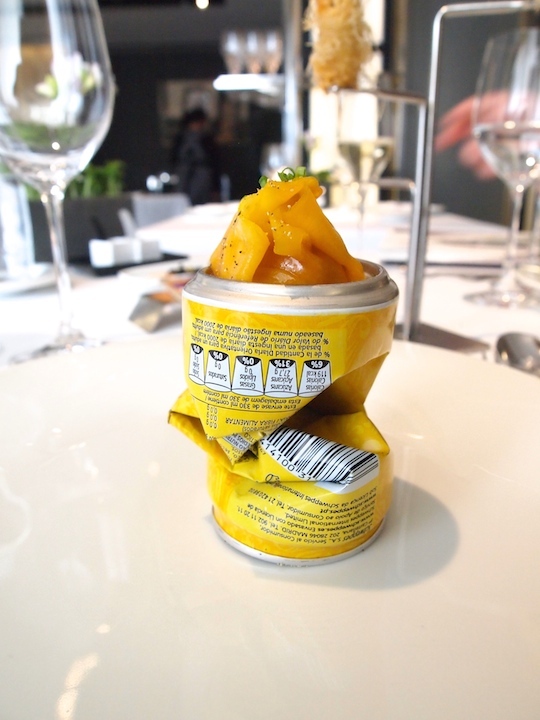 Frankly, I wasn't excited by the overall experience at Arzak. The food was outstanding, but certainly not extraordinary. 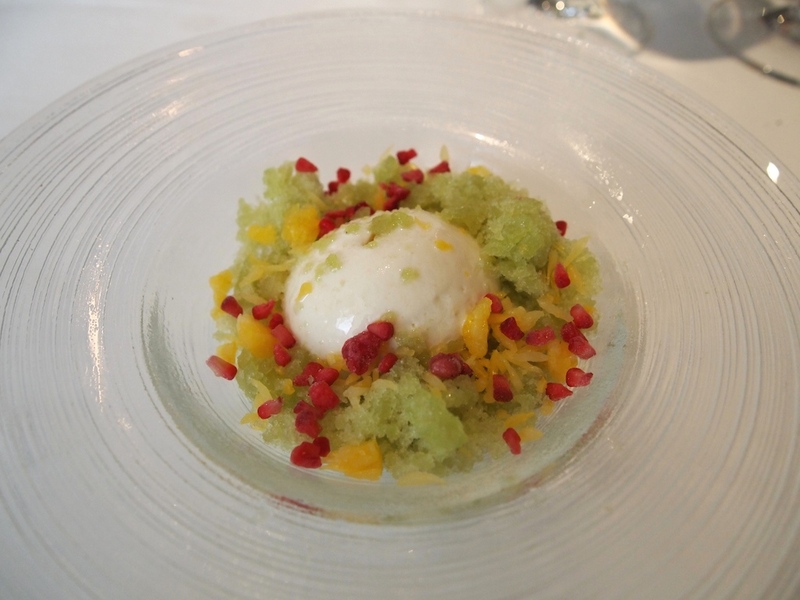 My lunch at Arzak was a rather anonymous affair, but then so was I - and I wanted to be. The rave stories however, all seem to come from people dining at the 'kitchen table'. 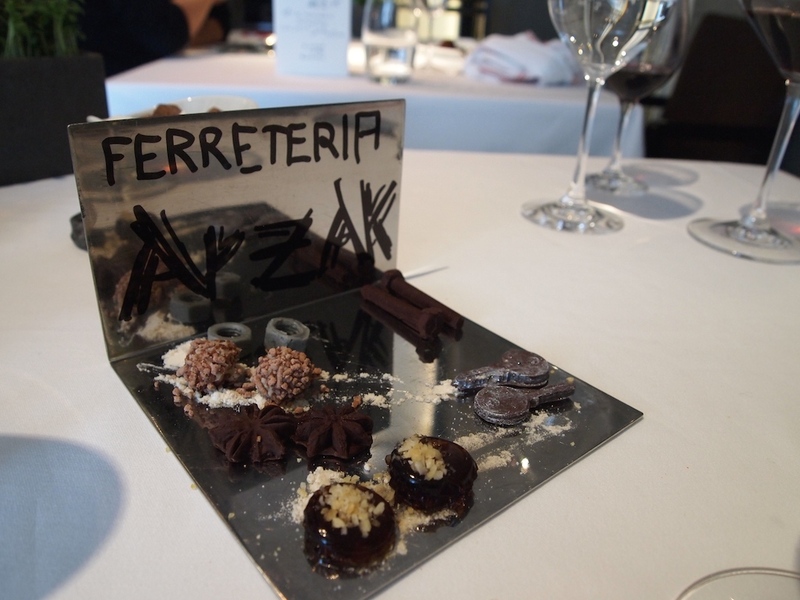 Could it be that at Arzak, all guests are equal but some more equal than others? I have no intention of finding out.